Alkenes can be treated with aqueous acids or, much more efficiently, with aqueous mercuric salts, followed by sodium borohydride, to produce alcohols. In those cases, the hydroxyl group is found in different places. Treatment with acid often results in a mixture of alcohols in which the OH groups are found in the most substituted positions in the structure, regardless of the position of the original alkene. Oxymercuration - demercuration results in the hydroxyl being fixed at the most substituted end of the former C=C bond. Those reactions are generally called hydration reactions because they result in the overall addition of H-OH across the double bond. Hydration reactions place an OH on one end and a H on the other end of a former double bond. Hydroboration - oxidation is a two-step sequence of reactions that also results in hydration of a double bond. However, this reaction is complementary to oxymercuration - demercuration. Instead of leaving an OH group at the most substituted end of the double bond, the hydroxy group is placed at the least substituted end of the double bond. Let's modify that statement a little bit. In reality, the reaction scheme above just shows the major product. The minor product has the hydroxy group at the more substituted position of the double bond. These two products might be found in different ratios, maybe even as close as 55:45, but the least substituted product always predominates. We will see more efficient hydroboration methods soon, leading to ratios above 95:5, or almost entirely the least substituted product. The product of non-hydrogen addition (i.e. OH group addition) at the most substituted end of the alkene is called a Markovnikov addition product. The product of non-hydrogen addition at the least substituted end of the alkene is called an anti-Markovnikov addition product. Oxymercuration - demercuration results in Markovnikov hydration. Hydroboration - oxidation results in anti-Markovnikov hydration. This selectivity is important in synthetic applications. We use natural products all the time as pharmaceuticals, vitamins and other health and beauty applications, but we can't always obtain these compounds directly from nature, for a number of reasons. It could be that the organism needs to be killed in order to harvest its products, or that there isn't enough of the source in nature ro meet demand. Frequently it is more economical to produce commercially useful compounds from convenient chemical feedstocks. Over the last century and a half, those feedstocks have come from coal tar and, later, petroleum. Currently, there is rapid progress underway to develop chemical feedstocks from sources such as vegetable and algal oil (i.e. oil from seaweed). These feedstocks are just compounds that can be converted synthetically into pharmaceuticals as well as in plastics, paints, coatings and other materials. Frequently, the starting materials for these processes contain C=C bonds that can be functionalized through electrophilic addition. Thus, electrophilic addition and related reactions are among the most important in the world, economically speaking. It's very valuable to be able to control the outcome of these reactions in order to make processes more efficient, producing fewer wasteful by-products. Regioselectivity, or control over where a reaction occurs, is very important. The Markovnikov versus anti-Markovnikov additions available in hydration are good examples of regiochemical control. Again, we are going to focus on the first of the two reactions in this sequence. That part is where the placement of the new substituent is decided. After the addition of the borane, an alkylborane is formed. The major isomer results from anti-Markovnikov addition. It seems pretty clear at this point that this reaction must proceed like other electrophilic additions to alkenes. The π electrons donate to the electrophile. In this case that's boron, which is strongly Lewis acidic because it lacks an octet. The boron ends up at the least substituted end of the double bond. That boron is beginning to look less electrophilic and more nucleophilic. We can easily imagine a hydride nucleophile being delivered to the carbocation. So far, the picture of how the alkylboration reaction works fits pretty well within our electrophilic addition framework. Unfortunately, there are some problems with this model. First of all, maybe 55% of the boration takes place in a Markovnikov sense, but the other 45% is added to form an anti-Markovnikov product. Certainly the secondary cation is favoured over the primary one, but if the reaction is proceeding through a carbocation, then the primary one shouldn't happen at all. Something is wrong with our model. Another hole is torn in the argument when we look at the results of stereochemical studies. We could, for example, take the following deuterium-labelled hexene and treat it with borane. We could look at the products via 1H NMR spectroscopy, and if we could see the coupling constant between the two protons shown in the structure, then we would know their relative arrangement in space. We would know their stereochemistry. If we did that experiment, then we would see that the hydrogen and the boron from the borane are added to the same face of the alkene. We don't get addition of boron to one face and hydrogen to the other. This type of addition is called syn addition; it is the opposite of anti addition. Hydroboration results in syn addition to the alkene. Show how a cationic intermediate and conformational changes would allow both syn and anti addition of borane to propene. That result means that, although some elements of our mechanism may reflect reality, we at least have a problem with timing. How can the hydride be delivered before the conformation has a chance to change? It has to happen pretty quickly. What if it happens at the same time as π bond donation to the boron? This reaction would best be described as a concerted addition. Two groups are added to the two ends of the double bond at the same time. During the transition state, two bonds would be breaking and two would be forming at the same time. 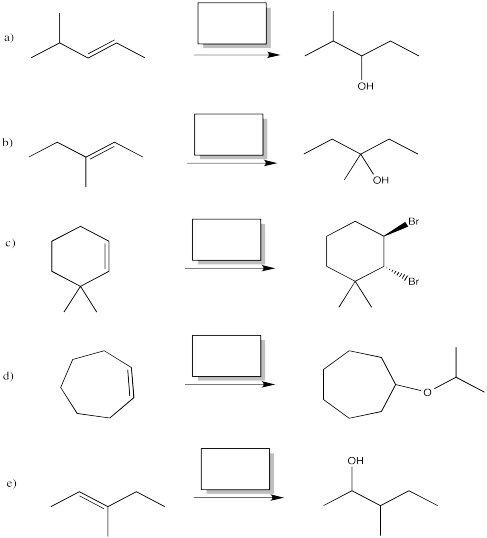 We can further improve our model of how the alkylboration works if we consider that disiamylborane and 9-BBN are much more effecient than borane in terms of regioselectivity. 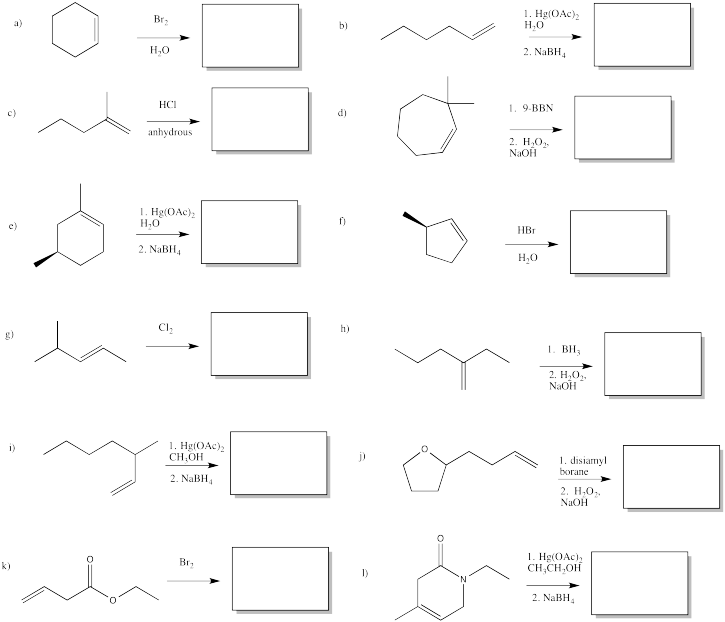 These reagents can produce close to 100% anti-Markovnikov addition. Explain how with the help of drawings. The subsequent reaction in this series involves removal of the boron and replacement with a hydroxyl group. The mechanism of this reaction may not be worth memorizing becuase it doesn't fit well within categories we have looked at so far. The important thing to know is that the oxygen ends up in exactly the same place as the boron. There is no change in stereochemistry at that position. Overall, the hydrogen and the hydroxy effectively group undergo syn addition, although they are added in different steps. Borane is frequently used in THF because borane alone is not very stable; it is quite pyrophoric, bursting into flame upon contact with air. In THF, borane forms an equilibrium with a Lewis-acid-base complex. Show this equilibrium reaction. Show products of the following reactions.